Tendon degeneration in the lower limb is a common overuse problem for athletes who do a lot of running and jumping. In the ankles, this manifests as Achilles tendinopathy. In the knee, this manifests as patellar tendinopathy. In people who are less active and/ or overweight, this can also occur but is thought to be less frequent. Symptoms may include marked pain, localised swelling and stiffness. A diagnostic ultrasound scan will often show that the tendon is thickened, disorganised and damaged. 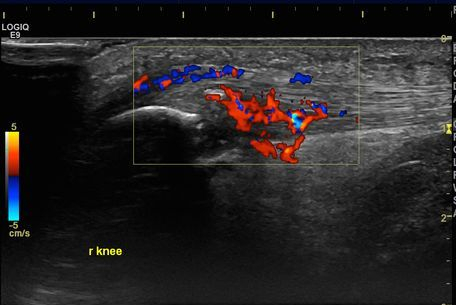 In severe cases, the addition of power doppler during the ultrasound scan will also demonstrate areas of abnormal blood vessel flow (neovascularity) around and into the tendon. Looking at these tissues under the microscope, these abnormal blood vessels are often accompanied by new nerve endings. It has been proposed that these nerve endings are responsible for the persistent pain that patients may experience. High volume image-guided injections (HVIGI) are a novel and promising treatment for Achilles and patellar tendinopathy. Using ultrasound guidance, a peritendinous injection of fluid (50mls around the Achilles tendon; 40mls around the patellar tendon) is injected into the interface between the tendon and underlying fat pad. This sterile fluid comprises local anesthetic, normal saline and only a small amount of corticosteroid. The intention of HVIGIs is to destroy the abnormal blood vessels and nerve endings that have grown into the tendon. This often results in significantly decreased pain, enabling patients to progress with their rehabilitation. This procedure is not a cure, but provides decreased pain and a ‘window of opportunity’ in which patients can progress with their rehabilitation. 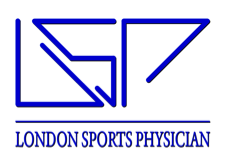 For this reason, it must be coupled with a comprehensive physiotherapy program to give a patient who suffers with tendinopathy the best chance of success.